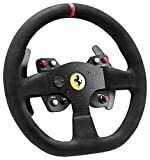 The Thrustmaster Ferrari Challenge Rim Add on also known as the Ferrari GTE rim was released in May of 2013 as the first add on wheel rim for the Thrustmaster eco-system. The rim is a 7/10 replica of Ferrari 458 Challenge rim and is similar in look to the Thrustmaster’s 599XX Evo rim. This rim retails at a slightly lower price then Thrustmaster’s other add-on rims. It has a brushed metal center column and the rim itself is made of re-enforced rubber. The rubber rim deadens the vibration a little bit, but overall the force feedback effects feel pretty good. The rim feels solid in your hands, although a bit small because its a 7/10 replica, but it’s much better rim than the stock rims that come with the standard TX or the T300. 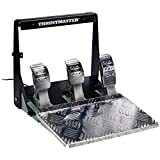 7/10 replica rim, 11 inches in diameter, re-enforced rubber grip, two 5 inch brushed metal sequential paddle shifters, 6 action buttons and a d-pad, 3 way spring switch, black brushed metal center column, Thrustmaster’s quick release system. This rim is built solid and with the exception of the Ferrari logo, there isn’t much plastic used. The center column is made of a nice brushed metal and the buttons are laid out for easy access on the rim. I particularly like the 3 way tack switch, it’s really easy to use on the fly when you need to change your camera position from hood to cockpit for example. Because the rim is really lite weight it responds well to inertia and gives very responsive force feedback. I do sense though when the rim vibrates the rubber grips deaden the vibration a bit more than other Thrustmaster rims. I’m not a huge fan of the 11 inch diameter, I prefer 12 inch diameter rim, but this size is pretty standard for most rims available on consoles. The button layout is also not ideal for PlayStation gamers. The “X” button is located on the bottom left which is a “selection” button in most games. That means you have to get used to either using your left thumb or reach across the wheel when navigating menus. 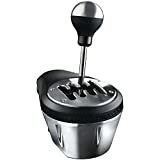 The paddle shifter are easy to reach and they give a nice “click” sound when engaged and immediately spring back into their starting positions. I have easily logged over 200 hours in the Ferrari Challenge Rim and it has held up through aggressive driving and alot of different people pounding on it and abusing it. When I have friends coming over to race, this is usually the rim I have everybody use, because of it’s durability. If you have a stock rim on your T300 or TX wheel base, this rim is a nice upgrade both in looks and feel. With the price point being a few dollars lower than the other Thrustmaster add-on rims, the 458 GTE Challenge rim is an easy choice if you want a rim upgrade, but are on a tight budget. This is a nice add on rim at an affordable price. I like it for it’s durability, good looks, and transfer of force feedback effects. I do wish it was an inch larger in diameter and came standard with some wheel base packages. Another good thing about the rubber rim is that it wipes down easy if you get anything on it. I usually just apply a little water on a cloth and wipe down the rim, especially after my friends come over for a nite of wings and racing! 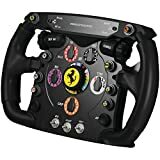 “This rim is a nice add-on if you are looking for an upgrade to your stock rim”The Thrustmaster 458 GTE Challenge rim has gotten a lot of love at Amazon, 4.5 stars with over 60 customer reviews. When this rim was released I couldn’t agree more that this rim was 4.5 stars. Now with the 599XX EVO available I am apprehensive to rate this rim above a 4. Love it for what it is, but is not quite the add-on rim of my dreams. 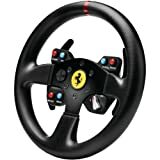 Have your tried the Thrustmaster Ferrari 458 Challenge rim or other Thrustmaster rim add-on’s? Let me know in the comments.